Alders Ledge: Has Burma Crossed Obama's "Red Line"? “Our military never uses chemical weapons and we have no intention to use them at all. I think the KIA (Kachin Independence Army) is accusing us wrongly,” presidential spokesman Ye Htut. When talking about Syrian President, Bashar al-Assad, Obama said that the use of chemical weapons would have "consequences and you will be held accountable". This was the "red line" that Obama had laid out in his warning to Assad. It appeared by the end of Obama's speech that killing people with bullets and bombs was perfectly acceptable as long as more unconventional weapons did not enter the conflict. This speech also laid out a clear line in the sand for all tyrants that might be interested in slaughtering their own citizens. Burma is no exception to that long list of tyrannical regimes interested in committing genocide and ethnic cleansing. The one difference is that the Junta in Burma has no desire to exercise restraint. Unlike Iran or China, Burma is starting off with a virtually clean slate when dealing with the West. They are free from the sanctions that bind Iran and lack the economic leverage that currently binds China's hands. When dealing with what the West affectionately calls "ethnic clashes", Burma has used every weapon in their arsenal thus far. 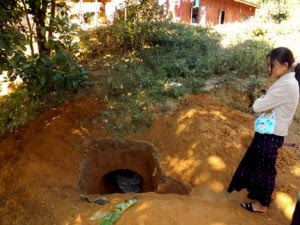 The "reform" party has engaged in mass starvation of the Rohingya, carpet bombing of the Kachin, and illegal deportations and mass executions of the Rohingya in the Arakan. 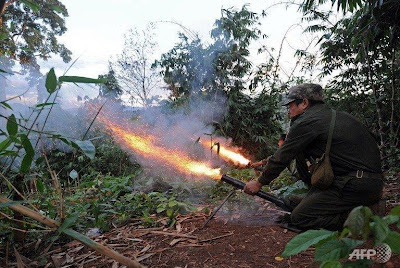 Now the Kachin rebels claim that the Burmese military is and has for some time been using chemical weapons to push the Kachin people over the border and into China. As with most "ethnic clashes" the UN and Western governments has once again hopped into the conflict on the side of the ruling power... in this case Burma. In 2011 the KIA made claims that the Burmese military had used chemical weapons. Back then the world seemed a little more interested since at the time Burma was still closed off to the outside world. However today with Burma ready to allow foreign economic investment the rest of the world seems painfully unwilling to admit that there might be chemical weapons being used. Once again money overrides human suffering. 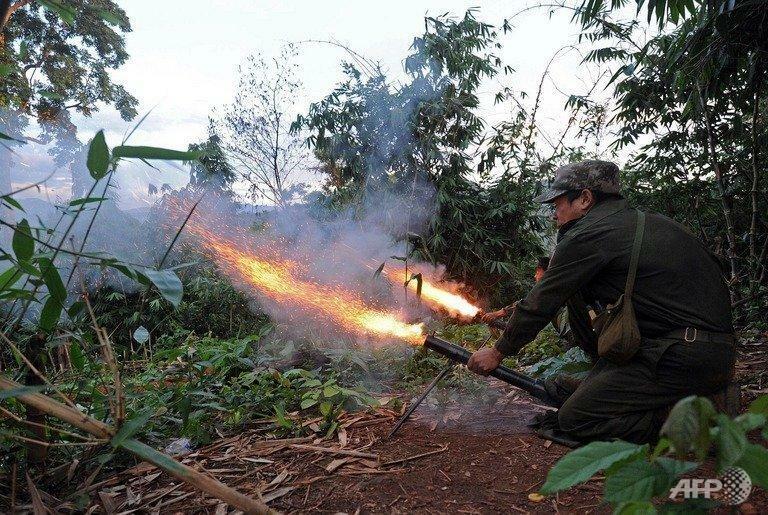 According to the KIA rebels the Burmese military has been using chemical weapons to push their soldiers off key outpost along the front line of the conflict. The soldiers that have claimed to survive the attacks say that the blast occur with a large wave of heat and then people loose consciousness. However the one flaw in their claims is the fact that nobody seems able to provide physical evidence of the bombs or the their affects. While dead bodies are easy to come by along the battle front the evidence of gassed soldiers or civilians seems impossible to find. For the most part chemical shell fragments and what appear to be cluster bombs are the only pieces of evidence provided. And while cluster ammunitions are illegal for use in any form of conflict their use has not been punished by the UN or ICC in either Syria or during the Iraq-Iran war. So there is no reason to believe that the UN will even enforce the law when dealing with Myanmar. As with most cases of war crimes the UN proves itself incompetent when facing the crimes as they occur. Even if Myanmar is found innocent and has not used chemical weapons it has committed several war crimes during this conflict. Evidence of mass executions, arbitrary arrests, and intentional targeting of civilians have all been documented in the conflict with the KIA. Myanmar has also committed several crimes against humanity when dealing with the Rohingya and other minority groups across Burma. And yet the UN refuses to act. So the question remains, has Burma crossed Obama's "Red Line"? And if so, what will the UN or US do to enforce these said "consequences"? Or will the West simply look the other way as yet another genocidal regime perpetrates horrific crimes against humanity?